Cheshire teenager Louise McLoughlin loves helping people enjoy golf – and her bubbly enthusiasm has won her the title of England Golf’s Young Ambassador of the Year. 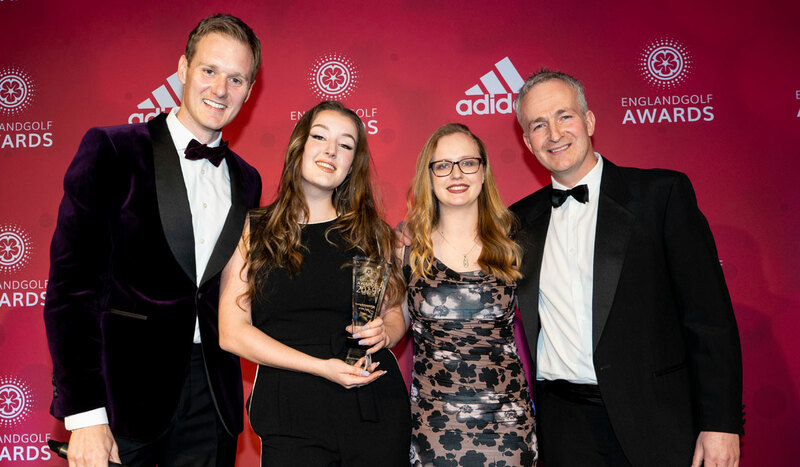 The 18-year-old received the accolade, presented in association with the Golf Foundation, at last night’s England Golf Awards, sponsored by adidas Golf. The audience of over 400 guests at the Royal Lancaster London heard how the judges were impressed by her enthusiastic personality and by the time she volunteers to support and inspire other golfers. Lou is a keen golfer who plays off eight and represents her club and the Cheshire women’s B team. She got into the sport when she was 11, because she wanted to join her brother and dad in their regular games with her grandfather. “My grandad was the reason I started,” she said. She loved the sport straight away and before long was involved with the Cheshire girls’ programme. She grabbed the chance to get involved as an Ambassador with Girls Golf Rocks, the recruitment campaign run by England Golf and the Golf Foundation. “There weren’t any other girls when I started, but now we’ve got nine girls at Bromborough and lots of girls in Cheshire,” said Lou. As well as encouraging the new girl players for the last two years, she also volunteers to support juniors and women beginners at her club and goes into local schools. “I love golf and I like making people happy,” she explains. Lou has also shared her views with the county men’s and women’s organisations, which have drawn up an action plan to get more young people into club membership. The secret, she believes, is keeping people excited about the game, and making it fun and flexible. Lou is currently at college studying sports management but will soon start an apprenticeship in engineering. Meanwhile, she’s continuing to work on her golf and would love to get down to four handicap this season – one better than her dad! Lou was presented with hr award by Brendon Pyle, Chief Executive of the Golf Foundation, and Emma Anderson, a past winner of the title who now works for England Golf. Caption (from left): Awards host Dan Walker, Lou McLoughlin, Emma Anderson and Brendon Pyle.